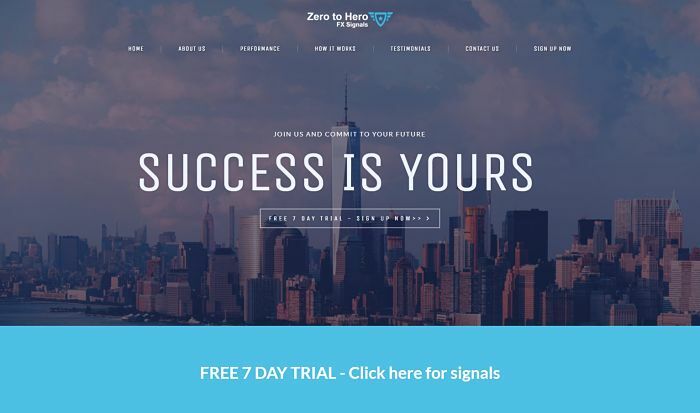 Zero To Hero Forex Signals (website) is a Forex signal service run by a team of experienced Forex traders. They offer some educational material but the main focus is to provide pure Forex signals for their members to follow. Impressively, they offer a free 7 day trial that you can sign up to on their website. Over the 7 day test period in the middle of October 2018, there were 13 signals in total with 9 winners and 4 losers. The total profit was approximately 320 pips. Zero To Hero indicated that this was actually a little higher than normal and they usually aim for 100-200 pips per week. There were signals on most days and they were very easy to follow. All the normal details were provided, entry price, stop loss and take profit. The signals are for market orders rather than pending orders which may prove difficult for some people to follow but the trades are generally entered at times of low volatility and there was no trouble entering at very close to the stated entry price. Signals came in by email and SMS so it should be easy to follow on the go. Signals came in throughout the day, most signals were in the European and US sessions but there were also a few signals in the Asian session. Signals were received on USDJPY, EURJPY, AUDUSD, EURUSD, USDCAD but Zero To Hero also say that they follow most of the majorly trades FX pairs. They do not trade exotics. Unfortunately Zero To Hero do not provide a detailed explanation of their strategy but they told us that it is mainly based on identifying medium term support and resistance zones and then waiting for a confirmed break of these zones with sufficient momentum. It is a shame they do not teach the strategy that they use but this is something that they have said they may consider in the future. 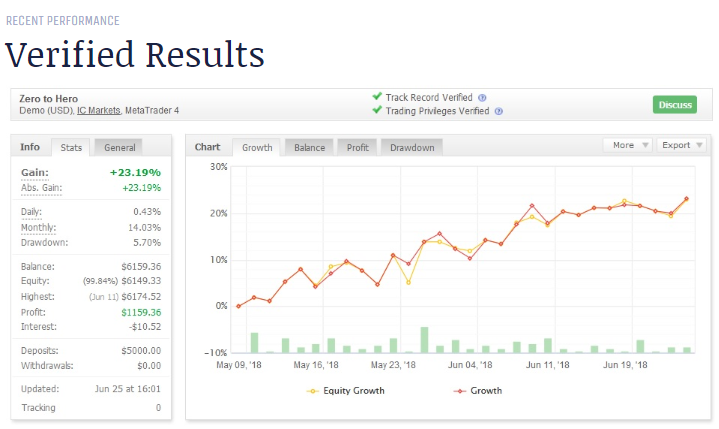 There Zero To Hero website has some historical data and most importantly there is a verified MyFXBook account with some actual trade data. The results seem impressive and are in line with the results achieved over the 7 day test period. Overall, Zero To Hero seem to offer an impressive service and there were very good results during the test period. They offer a 7 day free trial.